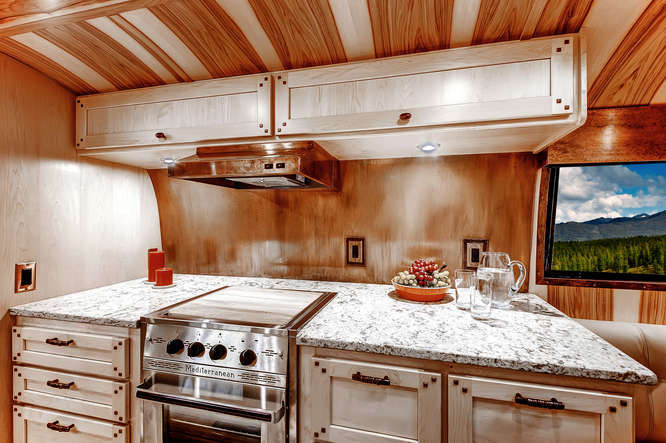 Have you ever laid your eyes on a custom designed Airstream? 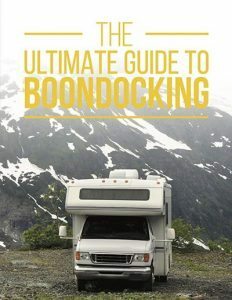 Theses days, many people are turning their iconic silver trailers into specially designed custom retreats on wheels. 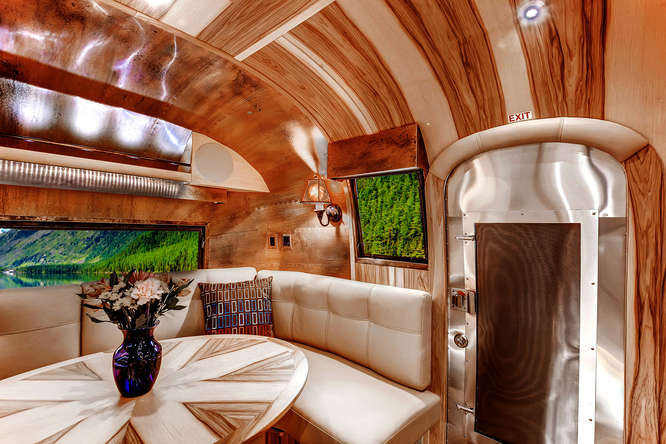 If seeing these rigs makes you jealous, this custom Airstream is guaranteed to make you swoon. 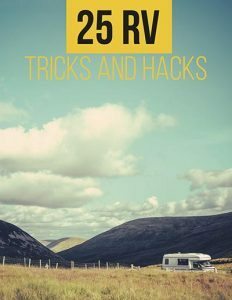 It may even provide just the right inspiration to have your own RV remodeled. 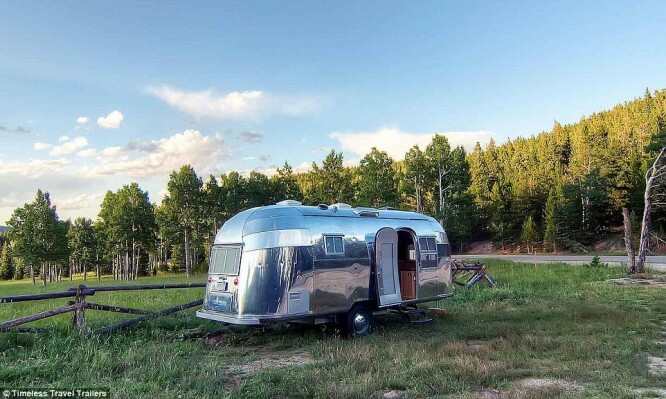 This custom designed and engineered 1956 Ridgway Whale Tail Airstream was built by hand by Timeless Travel Trailers. 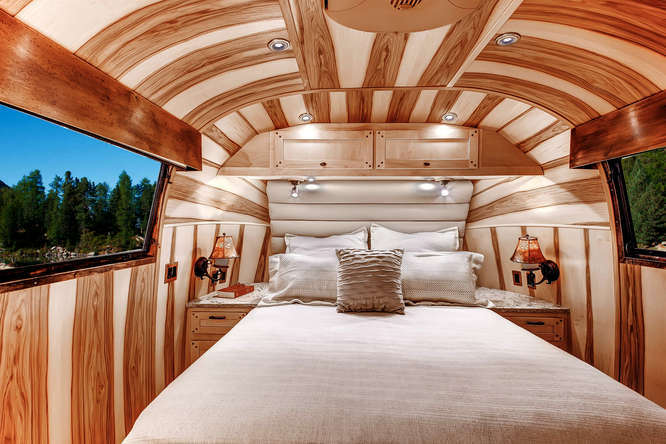 They started with a 19 foot 1956 Airstream Flying Cloud Whale Tail and after much hard work and effort, transformed it into a 34 foot 2014 Timeless Airstream named after a scenic town in southwest Colorado. The polished body sits on top a brand new custom chassis for added performance and safety. Two heavy duty axles were installed to maintain the Airstream’s vintage appearance. Extra length was added to the tongue to accommodate a propane powered generator. But, that’s not all — the biggest changes happened inside the trailer. Changes like a custom bar area with lighted racks, century old chestnut flooring, luxurious leather seating, hickory walls and maple cabinetry. The kitchen features three refrigerators. One is a dedicated wine cooler and the other two are regular, low profile, units. The spacious countertops in the bar and cooking area are made from gorgeous cambria granite. The stainless steel range features an oven and three burners. It is one of the most innovative models in the yachting industry. The bathroom boasts a shower lined with aluminum and reclaimed teak duck board bottom. 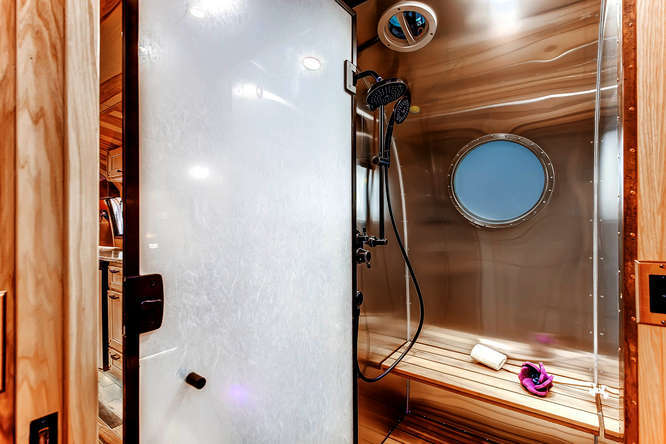 It also features an auto-tint shower door and a hand hammered copper sink. The luxurious bedroom features a Jameson style headboard, lighted vanity, and more. It even has climate controls separate from the rest of the trailer. 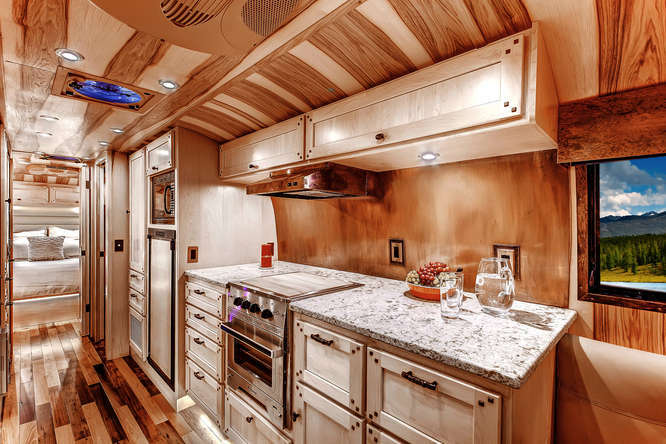 What do you think about this custom Airstream? What would you do if you could redesign your rig with the finest things money can buy? Share your thoughts in the comments below.